Nitra is a city in western Slovakia, situated at the foot of Zobor Mountain in the valley of the river Nitra. 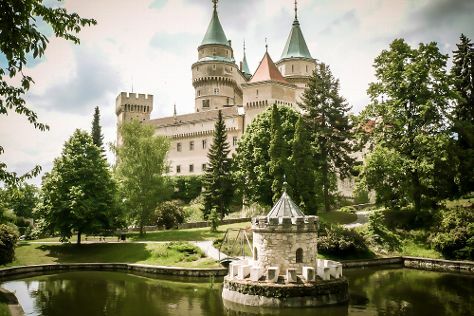 Venture out of the city with trips to Banska Bystrica (Banska Bystrica's Town Fortifications, The Clock Tower, & more), Banska Stiavnica (New Castle, Schemnitz Gallery, & more), Articular wooden church of Hronsek (in Hronsek), Piestany (Spas & Wellness & The Colonnade Bridge), Trencin Castle (in Trencin), Beckov castle (in Beckov), Aquapark Senec (in Senec), Cerveny Kamen Castle (in Cerveny Kamen), Obec Smolenice (in Smolenice), Cicmany (in Cicmany), Cachtice Castle (in Cachtice), Komarno City Centre (in Komarno), Bojnice (Bojnice Zoo & SNM - Bojnice Castle Museum), Manor House in Svaty Anton (in Svaty Anton), Trnava (City Tower, St. John the Baptist Cathedral, & more), Zvolen (Zvolen Castle & Pusty Hrad (Deserted Castle)), Mincovňa Kremnica (in Kremnica) and Thermal Spas (in Trencianske Teplice). There's much more to do: explore the historical opulence of Nitra Castle, take in the architecture and atmosphere at Church of St. Michael the Archangel, pause for some photo ops at Corgon, and get lost in a book at Chateau Appony. To see maps, where to stay, more things to do, and tourist information, you can read our Nitra trip planner. If you are flying in from Germany, the closest major airport is M. R. Štefánik Airport. In April, daily temperatures in Nitra can reach 20°C, while at night they dip to 7°C. Finish your sightseeing early on the 23rd (Sun) to allow enough time to drive back home.